Oct. 5 — Law firms are dipping their toes into mindfulness and meditation but their very nature prevents them from jumping in. 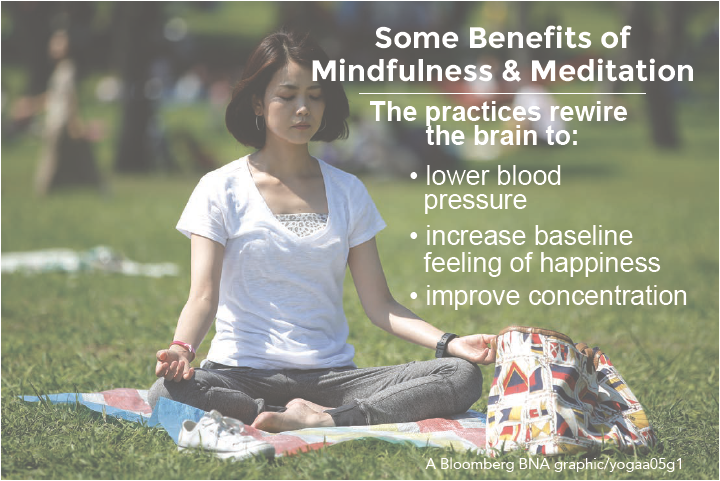 They are definitely interested but have limited time for the practices because time spent not working is lost revenue, Jeena Cho, an attorney and legal mindfulness facilitator, told Bloomberg BNA. Meditation is “a formal practice to train the mind to focus on one thing for a certain amount of time, like the breath,” said Cho, a partner at JC Law Group P.C., a bankruptcy firm in San Francisco. Mindfulness “describes the way we meet each moment, with clear-minded attention to and awareness of what is perceived in the present. It’s the attitude we carry throughout the day that attempts to value each moment and to be our best self,” she said. The legal profession is known to impose significant levels of stress, anxiety and depression on attorneys, which can lead to mental health issues and substance abuse, a recent ABA-sponsored study said. The benefits of meditation can help reduce stress and anxiety, Cho, co-author of “ The Anxious Lawyer,” said. Meditation increases a person’s baseline feeling of happiness, lowers blood pressure and increases concentration, which assists attorneys with productivity, she said. These benefits can be realized after just one six-minute meditation session, she said. But daily practice “is a must” to continue to experience the benefits, Cho said. Seyfarth Shaw, a Chicago-based law firm, is “testing the waters” and hopes to introduce a wellness program for attorneys by early 2017, Ronaldo Borger, head of human resources and talent at the firm, told Bloomberg BNA. The issue of stress management came up a few months ago at a monthly managing partner meeting, Borger said. Certain partners had experienced a lot of stress and “not the best of them was coming out,” he said. Calling stress management a “challenge in this industry,” the partners decided to form a core group to address the issue. The group is working on a “work-life integration initiative,” Borger said. One pillar of the initiative is individual development, which includes self-care and mindfulness, he said. About 100 Seyfarth attorneys are participating in the club, which has three one-hour webinars, Borger said. The attorneys can charge the time as “contribution hours,” he said in an e-mail. “These are all the hours that attorneys spend on non-billable activities but which contribute to the Firm or their own professional development,” Borger said. The company is talking to vendors and plans to offer more introductory mindfulness or wellness programs next year, he told Bloomberg BNA. A number of vendors offer online programs, which are “easily scalable” in comparison to offering live training sessions, Borger said. “Live training sessions tend to be much more helpful for people to learn and engage with the program, but much more expensive and slower to deploy,” Borger said. An online program would be easier for the firm to offer on a national scale, rather than limited to its largest office in Chicago, for example. For law firms, having someone come in “on a semi-regular basis” would help keep the attorneys “accountable” and “ground them in the practice,” Cho said. If you’re given an app, it’s like the firm is saying “here’s something to do on your own time,” she said. If a firm puts group sessions on a calendar, however, and lets the attorneys write off the time, it really shows a deeper commitment to wellness and that they care, Cho said. A Silicon Valley-based law firm offers bi-monthly on-site meditation for all its employees at its two offices, guided by Cho. The sessions are offered for 30 minutes during employees’ lunch hour because it’s a totally voluntary benefit, Cindy Hansson, director of human resources and legal support services for Hopkins & Carley in San Jose, Calif., told Bloomberg BNA. The law firm environment is a stressful one and this gives attorneys and staff a “way to unplug,” Hansson said. Hansson is a member of the firm’s wellness committee, which takes a holistic approach to wellness, she said. We don’t want to “fall into the trap” of focusing only on the physical, Hansson said. Feedback from participants has included comments that the mindfulness is “so calming” and the feeling “transcends the office,” she said. Cho believes large law firms are interested and recognize the benefits and importance of meditation and mindfulness, but says she has no longer-term commitments from the firms. The majority of Cho’s trainings have been at AmLaw100 firms including Morrison & Foerster, but they’ve only been for a single, introductory session. She thinks the reticence to sign on is primarily due to the time factor. Law firms are in a tough situation because “every hour not billed is lost revenue,” Cho said. If firm culture is to work, work, work, “how do you reconcile this by saying ‘we care about wellness?’” she asked. This goes to the core of why firms are struggling to retain talent, Cho said. Wellness is connected to other issues and “it’s more than giving a gym membership to the lawyers and saying, ‘we’re done with wellness,’” she said. These issues include work-life balance, effective communication and collaboration, and a sense of belonging, all of which are conducive to developing happy, healthy employees, Cho said. “When we start talking about wellness, we have to address these other issues; I think firms are hesitant to talk about it,” she said. Firms might be hesitant to address larger issues relating to attorney retention, but they aren’t hesitant to admit that there are problems. “Lawyers have stressful, demanding jobs,” Linda K. Myers, a partner at Kirkland & Ellis LLP in Chicago, told Bloomberg BNA in an e-mail. The ultimate goal is to keep employees “fresh” and the organization competitive, according to Life-XT’s website. Kirkland hopes the program will improve business by helping employees become “happier, healthier, more productive,” Myers said. “The client demands and pressure of Big Law won’t go away,” Seyfarth’s Borger said. But it’s necessary to “maintain a high-level of performance that’s integrated with the individual’s well being,” he said.